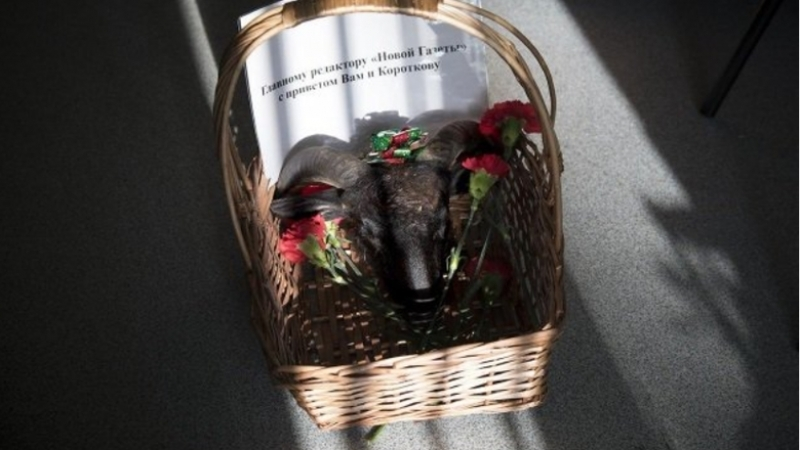 The Russian independent publication Novaya Gazeta was given a wreath and a basket with a ram’s head, thus threatening journalist Denis Korotkov, the author of publications about Russian mercenaries in Syria. Novaya Gazeta claims that an information campaign is being conducted on the Internet against Korotkov; He is accused of publicizing the personal data of Russian military personnel, in particular, the pilots in Syria, claiming that it endangered their families. In a statement, Novaya Gazeta notes that the publication has never published the data of pilots fighting in Syria, which would put their families at risk. The editors have already contacted the police in connection with the incoming threat and state that they know where the threat comes from. According to Meduza publication, Korotkov published materials about Russian mercenaries in the Petersburg edition of Fontanka internet-newspaper. While he was working there, threats against him were also spread on the Internet. In the summer of 2018, Korotkov quit from Fontanka and later was employed in Novaya Gazeta. Earlier, in September of this year, the Security Service of Ukraine called the names of Russian mercenaries of the Wagner PMCs who died or were injured in Syria, including foreign citizens.